Abdominal ultrasound uses high frequency sound waves to produce two-dimensional images of the body's soft tissues, which are used for a variety of clinical applications, including diagnosis and guidance of treatment procedures. Ultrasound does not use ionizing radiation to produce images, and, in comparison to other diagnostic imaging modalities, it is inexpensive, safe, fast, and versatile. Abdominal ultrasound is used in the hospital radiology department and emergency department, as well as in physician offices, for a number of clinical applications. Ultrasound has a great advantage over x-ray imaging technologies in that it does not damage tissues with ionizing radiation. Ultrasound is also generally far better than plain x rays at distinguishing the subtle variations of soft tissue structures, and can be used in any of several modes, depending on the area of interest. As an imaging tool, abdominal ultrasound generally is indicated for patients afflicted with chronic or acute abdominal pain; abdominal trauma; an obvious or suspected abdominal mass; symptoms of liver or biliary tract disease, pancreatic disease, gallstones, spleen disease, kidney disease, and urinary blockage; evaluation of ascites; or symptoms of an abdominal aortic aneurysm. Abdominal pain. Whether acute or chronic, pain can signal a serious problem—from organ malfunction or injury to the presence of malignant growths. Ultrasound scanning can help doctors quickly sort through potential causes when presented with general or ambiguous symptoms. All of the major abdominal organs can be studied for signs of disease that appear as changes in size, shape, or internal structure. Abdominal mass. Abnormal growths—tumors, cysts, abscesses, scar tissue, and accessory organs—can be located and tentatively identified with ultrasound. In particular, potentially malignant solid tumors can be distinguished from benign fluid-filled cysts. Masses and malformations in any organ or part of the abdomen can be found. Liver disease. The types and underlying causes of liver disease are numerous, though jaundice tends to be a general symptom. Sometimes, liver disease manifests as abnormal laboratory results, such as abnormal liver function tests . Ultrasound can differentiate between many of the types and causes of liver malfunction, and it is particularly good at identifying obstruction of the bile ducts and cirrhosis, which is characterized by abnormal fibrous growths and altered blood flow. Pancreatic disease. Inflammation of the pancreas—caused by, for example, abnormal fluid collections surrounding the organ (pseudocysts)—can be identified by ultrasound. Pancreatic stones (calculi), which can disrupt proper functioning, can also be detected. Gallstones. Gallstones are an extremely common cause of hospital admissions. In the non-emergency or non-acute setting, gallstones can present as abdominal pain, or fatty-food intolerance. These calculi can cause painful inflammation of the gallbladder and obstruct the bile ducts that carry digestive enzymes from the gallbladder and liver to the intestines. Gallstones are readily identifiable with ultrasound. Photograph by Brownie Harris. The Stock Market. Reproduced by permission. Spleen disease. The spleen is particularly prone to injury during abdominal trauma. It may also become painfully inflamed when infected or cancerous. The spleen can become enlarged with some forms of liver disease. Kidney disease. The kidneys are also prone to traumatic injury and are the organs most likely to form calculi, which can block the flow of urine and cause further systemic problems. A variety of diseases causing distinct changes in kidney morphology can also lead to complete kidney failure. Ultrasound imaging has proved extremely useful in diagnosing kidney disorders, including blockage and obstruction. Abdominal aortic aneurysm. This is a bulging weak spot in the abdominal aorta, which supplies blood directly from the heart to the entire lower body. A ruptured aortic aneurysm is imminently life-threatening. However, it can be readily identified and monitored with ultrasound before acute complications result. Appendicitis. Ultrasound is useful in diagnosing appendicitis, which causes abdominal pain. Ultrasound technology can also be used for treatment purposes, most frequently as a visual aid during surgical procedures—such as guiding needle placement to drain fluid from a cyst, or to guide biopsies. Ultrasound includes all sound waves above the frequency of human hearing—about 20 thousand hertz, or cycles per second. Medical ultrasound generally uses frequencies between one and 10 megahertz (1–10 MHz). Higher frequency ultrasound waves produce more detailed images, but they are also more readily absorbed and so cannot penetrate as deeply into the body. Abdominal ultrasound imaging is generally performed at frequencies between 2–5 MHz. An ultrasound scanner consists of two parts: the transducer and the data processing unit. The transducer both produces the sound waves that penetrate the body and receives the reflected echoes. Transducers are built around piezoelectric ceramic chips. (Piezoelectric refers to electricity that is produced when you put pressure on certain crystals such as quartz.) These ceramic chips react to electric pulses by producing sound waves (transmitting) and react to sound waves by producing electric pulses (receiving). Bursts of high-frequency electric pulses supplied to the transducer cause it to produce the scanning sound waves. The transducer then receives the returning echoes, translates them back into electric pulses, and sends them to the data processing unit—a computer that organizes the data into an image on a television screen. Because sound waves travel through all the body's tissues at nearly the same speed—about 3,400 miles per hour—the microseconds it takes for each echo to be received can be plotted on the screen as a distance into the body. (The longer it takes to receive the echo, the farther away the reflective surface must be.) The relative strength of each echo, a function of the specific tissue or organ boundary that produced it, can be plotted as a point of varying brightness. In this way, the echoes are translated into an image. A-mode. This is the simplest type of ultrasound in which a single transducer scans a line through the body with the echoes plotted on screen as a function of depth. This method is used to measure distances within the body and the size of internal organs. B-mode. In B-mode ultrasound, which is the most common use, a linear array of transducers simultaneously scans a plane through the body that can be viewed as a two-dimensional image on screen. M-Mode. The M stands for motion. A rapid sequence of B-mode scans whose images follow each other in sequence on screen enables doctors to see and measure range of motion, as the organ boundaries that produce reflections move relative to the probe. 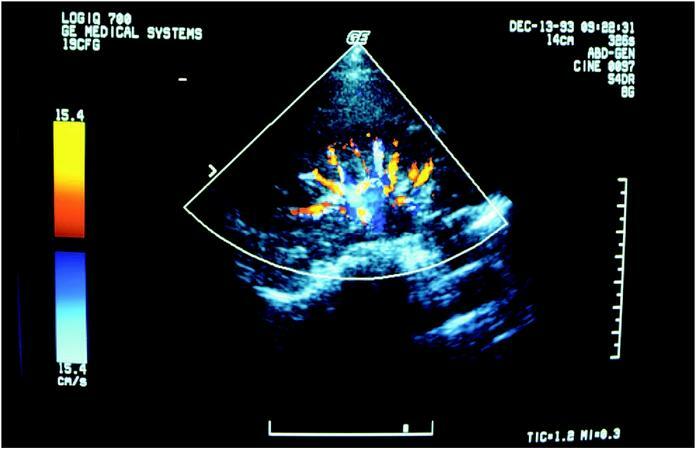 M-mode ultrasound has been put to particular use in studying heart motion. Doppler mode. Doppler ultrasonography includes the capability of accurately measuring velocities of moving material, such as blood in arteries and veins. The principle is the same as that used in radar guns that measure the speed of a car on the highway. Doppler capability is most often combined with B-mode scanning to produce images of blood vessels from which blood flow can be directly measured. This technique is used extensively to investigate valve defects, arteriosclerosis, and hypertension, particularly in the heart, but also in the abdominal aorta and the portal vein of the liver. The actual procedure for a patient undergoing an abdominal ultrasound is relatively simple, regardless of the type of scan or its purpose. Fasting for at least eight hours prior to the procedure ensures that the stomach is empty and as small as possible, and that the intestines and bowels are relatively inactive. This also helps the gallbladder become more visible. Prior to scanning, an acoustic gel is applied to the skin of the patient's abdomen to allow the ultrasound probe to glide easily across the skin and to better transmit and receive ultrasonic pulses. The probe is moved around the abdomen's surface to obtain different views of the target areas. The patient will likely be asked to change positions from side to side and to hold the breath as necessary to obtain the desired views. Usually, a scan will take from 20 to 45 minutes, depending on the patient's condition and anatomical area being scanned. Ultrasound scanners are available in different configurations, with different scanning features. Portable units, which weigh only a few pounds and can be carried by hand, are available for bedside use, office use, or use outside the hospital, such as at sporting events and in ambulances. Portable scanners range in cost from $10,000 to $50,000. Mobile ultrasound scanners, which can be pushed to the patient's bedside and between hospital departments, are the most common configuration and range in cost from $100,000 to over $250,000, depending on the scanning features purchased. A patient undergoing abdominal ultrasound will be advised by his or her physician about what to expect and how to prepare. As mentioned above, preparations generally include fasting. In general, no aftercare related to the abdominal ultrasound procedure itself is required. Discomfort during the procedure is minimal. Properly performed, ultrasound imaging is virtually without risk or side effects. As a diagnostic imaging technique, a normal abdominal ultrasound is one that indicates the absence of the suspected condition that prompted the scan. For example, symptoms such as abdominal pain radiating to the back suggest the possibility of, among other things, an abdominal aortic aneurysm. An ultrasound scan that indicates the absence of an aneurysm would rule out this life-threatening condition and point to other, less serious causes. Because abdominal ultrasound imaging is generally undertaken to confirm a suspected condition, the results of a scan often will confirm the diagnosis, be it kidney stones, cirrhosis of the liver, or an aortic aneurysm. At that point, appropriate medical treatment as prescribed by a patient's physician is in order. Ultrasound scanning should be performed by a registered and trained ultrasonographer, either a technologist or a physician (radiologist, obstetrician/gynecologist). Ultrasound scanning in the emergency department may be performed by an emergency medicine physician, who should have appropriate training and experience in ultrasonography. Dendy, P. P., and B. Heaton. Physics for Diagnostic Radiology. 2nd ed. Philadelphia: Institute of Physics Publishing, 1999. Kevles, Bettyann Holtzmann. Naked to the Bone: Medical Imaging in the Twentieth Century. New Brunswick, New Jersey: Rutgers University Press, 1997. Zaret, Barry L., ed. The Patient's Guide to Medical Tests. Boston: Houghton Mifflin Company, 1997. Kuhn, M., R. L. L. Bonnin, M. J. Davey, J. L. Rowland, and S. Langlois. "Emergency Department Ultrasound Scanning for Abdominal Aortic Aneurysm: Accessible, Accurate, Advantageous." Annals of Emergency Medicine 36, No. 3 (September 2000): 219-23. Sisk, Jennifer. "Ultrasound in the Emergency Department: Toward a Standard of Care." Radiology Today 2, No. 1 (June 4, 2001): 8-10. American College of Radiology. 1891 Preston White Drive, Reston, VA 20191-4397. (800) 227-5463. http://www.acr.org . American Society of Radiologic Technologists (ASRT). 15000 Central Avenue SE, Albuquerque, NM 87123-2778. (800) 444-2778. http://www.asrt.org . Radiological Society of North America. 820 Jorie Boulevard, Oak Brook, IL 60523-2251. (630) 571-2670. http://www.rsna.org . Society of Diagnostic Medical Sonography. 12770 Coit Road, Suite 708, Dallas, TX 75251-1319. (972) 239-7367. http://www.sdms.org . My husband recently had an abdominal ultrasound due to possible liver problems. The Dr office called and said that the results showed poor penetration and/or diffuse penetration. He is now scheduled for a CT scan. What does poor penetration/diffuse penetration mean in this context? ive recently been diagnosed with Coronary Heart Disease , Gall stones , and now possible diabites type 2 . this has all happened within the last 4 months ! Is it possible that the gallstones could be the main cause for these problems ? As im very confused having no-idea i had / have any of the problems . Please Please ANY advice , help, information would be gratefully received . My husband recently had an abdominal ultrasound. The technician could not "see" the liver during the test and I'm wondering what could cause that. I've read that ultrasound cannot see through air, but there shouldn't be air in the abdominal cavity, should there? What other options are available for imaging the liver? I have been diagnosed multiple fibroids and large uterus and will be undergoing TVS and whole abdomen ultrasound. Is this a dangerous disease? Is there is any extra software is required to identify internal bleeding of a person? With ultra sound image only radiologist can easily mark the portions in the ultrasound image for identifying the bleeding? please answer my query.Thanks in advance. Hi my son was recently admitted into hospital with suspected appendicitis as it turned out it was not appendicitis they don't ultrasound scan on him appendix was not visible on the scan said there was fluid visible They diagnosis for this is mesenteric adenitis . Just worried because my son was recently diagnosed with H.PYLORI complete his treatment only two weeks ago been discharged now and his symptoms are still the same his tummy is very swollen .